What is the Asset Exchange? The Asset Exchange is an Exchange based on Blockchain technology. Everybody can to create his/her own Asset tokens on the Blockchain. The Asset can represent anything , whether it is financial services, crowdfunding, support for a website, memberships, commodities or other things you can imagine. Once you have chosen an Asset, you can see the Asset ID in the top left corner. We will need this ID to get data from an Asset. I have chosen the SuperNET Asset in this example as it is frequently traded and has a lot of historical data we can look at. Please remember you need to have your instance of Nxt running on your system to follow the rest of this tutorial. First, let us look at the Meta Data of an Asset. The following script will give you output of the original Asset Setup. As always, I recommend you the page http://localhost:7876/test when looking up the API calls. On this page you can see which calls are for receiving data (GET) or submitting data (POST) to the Blockchain. We will start with GET requests and the call getAsset. You can use this script to display information on Assets on your website, to overview which Assets have been created in short or long term or just for a personal list of Assets and their functions. You see two variables “initialQuantityQNT” and “quantityQNT”. QNT stands for “Quantity”, the initialQuantity is setup by the Asset creator in the beginning. As some of the Assets might be deleted, the “quantityQNT” shows us how many Assets exist at the moment. We also need the “decimals” variable. The Asset we look at has 4 decimals, which means that the number of Assets shown in the table need to be divided by 10,000 (4 zeroes) to get the actual number. The above Asset would result in a quantity of currently 816,061.0000 Assets. 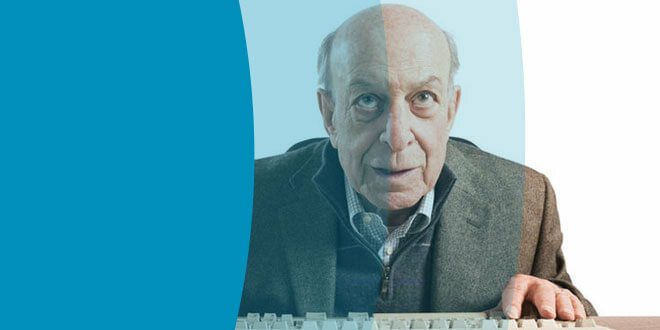 The Account is the numerical Nxt account of the Asset creator and the accountRS the same account identifier in Reed-Solomon (RS) format. The numberOfTrades, numberOfTransfers and numberOfAccounts are calculated at the point in time when you run the call. You can shorten the “getAsset” API call with leaving out “includeCounts”: “true” at the above $.getJSON call, consequently you will not receive the number of Asset holders, transfers and trades but the API call will get quicker. The script above can be used to display current prices and Offers for an Asset on your website, and to show the whole Orderbook of any Asset. Furthermore you can use it and analyse tendencies. As you additionally have the Accounts for all bids and asks, you can analyze the bids and asks for the amount of Accounts that are trading on the platform. This time we had to do some more $.getJSON queries to get the information we want. First, we need the decimals of the Assets to do the calculation about the Quantity as mentioned with the first call. Second, we want to get both: Ask and Bid orders. This needs one query for each of the API calls. We also see a new variable that needs explanation. “priceNQT” is the price of an Asset per QuantityQNT. The price on the API is displayed in priceNQT per QuantityQNT. So, what is NQT and what is the difference to QNT? NQT refers to NXTQuant, the smallest number we have in NXT, which is 0.00000001 NXT (8 decimal places). We also have to take into account the decimal places, which we have to multiply again to get the price per actual Asset. I have used the variable var NQTdivider = 8 — decimals; to get the number of power we need to divide the Quantity by and get the current price in NXT per Quantity. I hope you have enjoyed this third installment of “Coding for NXT Crypto Platform”. In the next article, I will be covering Historical Data and Account information. In the last topic I showed you how to retrieve basic data about Assets from the Nxt Asset Exchange. In this article I want to cover how to receive historical trades. Historical trades can either be from any Account or from any Assets, we are continuing as we did before and get latest trades from the Asset SuperNET. Again we will be using the parameters firstIndex and lastIndex to retreive only the last 10 entries. If you want to get more trades, just change lastIndex to a higher number or erase both firstIndex and lastIndex completely. If you erase firstIndex and lastIndex it is possible that you get a limited number of entries — this can be setup in your Nxt configuration file. Have a look at the property: nxt.maxAPIRecords=100 and configure it to your needs (just when you are working without an admin password). Now, let’s jump back to the code. For the API request, as stated above, we limited the response by setting firstIndex and lastIndex to 10 entries. Furthermore, the includeAssetInfo set as true will show the decimal for the Asset and the Name of the Asset. This will make the call a bit slower but especially when we are looking at more than one Asset a very helpful addition. Instead of including includeAssetInfo we could make a getAsset call to receive those parameters (when just looking at one Asset this might be recommended). But when you are looking at an Account last trades instead of an Asset, this can save a lot of work and time. The most important calculations to mention for this script are the Nxt timestamp, quantity and price. They are calculated as already explained above. Analysing the historical data will get you a lot of information about the frequency of trading and how many accounts have been trading an Asset. The more accounts are involved in trading, the better an Asset is spread among traders, which is usually a good sign. Of course, you have to be aware that you do not know the origin of Accounts. It is possible that one person creates multiple accounts and trades from all of these accounts. The Asset appears to be traded by more parties, which seems beneficial for the Asset owner, on the other hand people might create several accounts to track different types of holdings. In a lot of cases it makes sense for a user to have more than just one Account. As you already know, the Blockchain is fully transparent; you can see any transaction in the network and all the holdings of one account. It still enables you to write encrypted messages, which cannot be read by anybody but the person who holds the passphrase of either the sender or the recipient. The next step for you is to find out how to create a nice interface to view Accounts. All the necessary steps to get there are explained here. The API call needed to get Account information is getAccount. You could also use getAccountAssets to monitor Asset holdings but getAccount will show you all the holdings of one account. 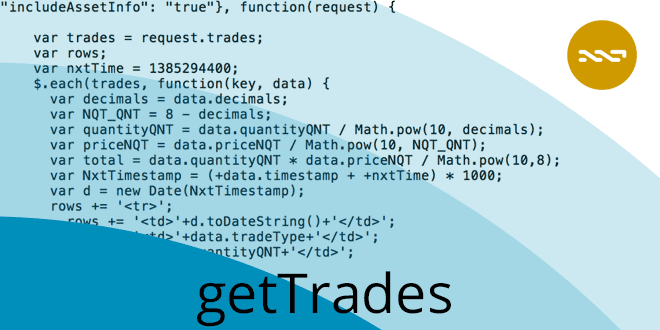 A hint: as in the getTrades API, you can decide to include furter informations with includeLessors, includeAssets, includeCurrencies or includeEffectiveBalance. Enjoy developing with Nxt! In the next article, we will explore creating transactions and more details about the Blockchain. The Nxt Blockchain is the heart of Nxt. Every Transaction ever made is recorded on the Blockchain. The Blockchain is a decentralized database, which is saved on your computer. To prevent spam, for every transaction you have to pay fees in the native currency, which will be NXT for us using the Nxt Blockchain. In previous articles I have shown how to setup and configure your Nxt Software as well as how to read data, this time we write data on the Blockchain, starting with a simple example. Throughout the article, I want to focus on tools you can use while creating Transactions on Nxt. Codewise, creating a transaction on Nxt is very similar to reading data from the Blockchain; There are some topics we have to cover before creating our first transaction. To create a transaction, we first need a Nxt Account and some NXT, in order to pay for Blockchain fees. So, let us log in to Nxt and create our first account. In order to have a secure Nxt account, you need a strong passphrase. Working With virtual currencies we use the term passphrase instead of password, this describes strong entropy and should be more secure than a regular password. When you are using the official Nxt Client, you can use the implemented passphrase creation function, which will give you a passphrase which contains 12 words. You can also create your own passphrase, make sure it contains enough characters and entropy. To generate a passphrase it is recommended to use Software such as KeePass, LastPass, Dashlane or Online Tools like PasswordsGenerator.net or Fourmilab.ch. DON’T HAVE AN ACCOUNT? CLICK HERE TO CREATE ONE! will bring you to the passphrase generator. Afterwards (or with your self-created passphrase), you can log in to your Account. If you do not have NXT yet, the quickest method is when you already got some virtual Currencies like Bitcoin, Litecoin, Ethereum or others. You can exchange them via Shapeshift or buy your coins on another exchange and transfer them to your wallet. In the next steps, we use your passphrase to sign and broadcast transactions. Your passphrase can also be seen as your private Key. With a secure passphrase, we can now look into the code of creating a send-NXT-Transaction. We send out 1 NXT to a recipient, which you see in the code and change it there for another recipient. Insert your passphrase in the following code and run it to create the transaction. This script is creating a sendMoney transaction. As you see we have been changing the function used in previous articles $.getJSON to $.post. When creating transactions, it is necessary to switch to POST format instead of GET requests as with the previous functions. For reference to the API details, have a look at http://localhost:7876/test?requestType=sendMoney. The output you see on the page contains various information, the variable feeNQT has been filled in with the correct information, you can check how much the fee is for the transaction you have created. 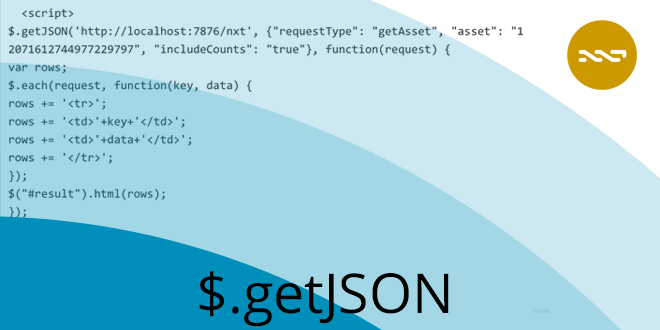 You see the whole transactionJSON you have inserted in JSON format and you receive the transaction transactionBytes. The transactionBytes embeds all the transaction information you have in the transactionJSON. The above created transaction will not be broadcasted to the network yet because we set “broadcast”: false in our object. When setting this true the transaction will be broadcasted and will cost you 1 NXT. As you can see, we do not need many variables to create our first transaction. Now that we know how to create a sendMoney transaction that has not yet been broadcasted, we can use a script that looks similar to the above one to broadcast the transaction. To make it more understandable I am extending the above script with a button that takes the previously created transaction and transfers it to the network on submitting the button. Effectively when running the script you have your first (small, not yet secure!) interactive Nxt wallet. transactionBytes The transactionBytes we have created with the previous declared function. With these few lines of code, we can create a transaction and broadcast it. Yet, we are still defining all the variables directly within the code. In the next articles, I am going to show you how to add encrypted messages to a transaction and how to get these data from a user input you have on the page. We will have a deeper look into phasing and pruning of transactions. Suppose you have a circle of friends who you meet with in a sports bar to drink beer, watch sports and make bets. You can make bets on the Nxt Blockchain and have a basic Python app automate it for you. In my first article I introduced basics of a blockchain. As we learned, the most important value proposition of the blockchain is immutability of data submitted in transactions recorded into blocks, from which a blockchain is built. Today I want to show how to build a simple but fully functional betting app in python. For the betting app that I present, immutability of data may be required, but in the case a bet should need to be canceled, the app can be modified to take into account this additional functionality. NRS (Nxt Reference software) 1.10.2: https://bitbucket.org/JeanLucPicard/nxt/downloads/, Python 3 (or Python 2 with slightest modification). A beer or two (optional). A user submits a bet (transfers any amount of NXT coins) to the betting account and adds a public unencrypted attachment. In the attachment he should write the id of the bet, a colon and a number indicating his choice in the corresponding bet. Let’s give an example: the sports bar runs a bet which football team wins. They assign an ID to this game, let’s say “30”. “1” – home team wins. “2” – other team wins. “3” – tie. When the time comes, the betting host runs the app to find winners and process payments. The host can take a small fee for the service. For our app we will need to import a few modules and write the function to submit queries which will be used a few times through the app. secretPhrase = "bla bla bla"
The function returns a JSON string to be decoded, with transactions and attachments to be parsed. Also a few variables are initialized. Next we must query the betting account to fetch all incoming transactions. decode JSON and load it to a variable for further processing. As we have all the data now, we loop through the list and discard some of the transactions we don’t need. For instance, we don’t need to process outgoing transactions, so we continue the loop from the next item. Next we pull out the attachment, check if it is not encrypted and strip whitespace. Next step is to match the submitted message against the regular expression. It must satisfy the format “Number:Number”, the first number can be up to 3 digits. The betting app accepts up to 3 command-line arguments: id of the game, the choice number that has won, and third optional parameter in double quotes to name the winner choice for verbosity in the payout message. The app will process transactions with game id 30 and rewards players who chose ‘1’. Next we must calculate the sum of money submitted for our game, make a list of dictionaries of players who guessed the correct number, and calculate the total sum for distribution after the betting host gets his optional service cut. We have winners in the ‘players’ list of dictionaries, we have money to distribute in ‘afterFee’, let us now process payouts. message = "Payout for correct bet in poll "
Needless to say the app can be improved to process errors, cancel bets or optionally allow other parameters in attached messages. Attached messages can be submitted with the Nxt Client (NRS) or from a web wallet that allows sending attachments. To make transactions on the Nxt Blockchain you need NXT coins, which you can purchase directly, by exchanging Bitcoin for NXT or by attending the “Lucky Node” project by running a public Nxt node (Nxt server). To learn how to participate in the Lucky node project, please visit https://nxtforum.org. There are over a hundred API calls you can make to the Nxt server, a full list with mandatory and optional parameters and examples is available at https://nxtwiki.org/wiki/The_Nxt_API. In my first article I introduced blockchain theory, what it can do for your software project and the basics of interacting with the Nxt blockchain in PHP. 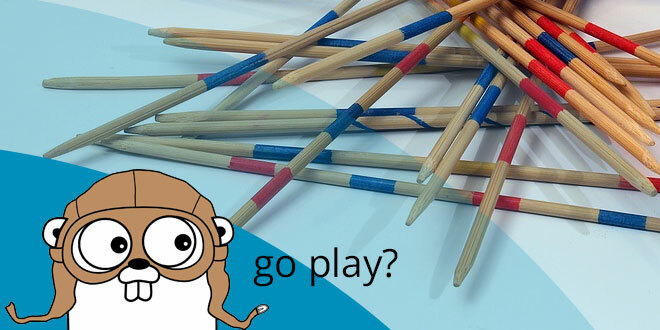 Today I am going to present a small Lottery program written in Go. The program is fully functional and runs a lottery every Sunday . It was originally written in PHP, both sources are available for download from the Nxt Data Cloud . Data feed for this app is ‘tickets’ submitted by users in attachments. A lottery player sends 10 NXT to the lottery account and attaches a public unencrypted message with a string of 5 numbers, ranging from 0 to 30 separated by commas. The attachment must be unencrypted for rewards to be publicly auditable using the blockchain. The app makes a request to the NXT server to fetch all transactions from the lottery account, sorts through them, selects only valid transactions and creates a slice of maps (multidimensional array in PHP) of players’ accounts and their strings of numbers. It also calculates the total sum of NXT payable to the players from the sums of all valid tickets. Upon receiving all the valid data the app runs three rounds of the lottery. Each round receives a portion of the total payable sum, split between concurrent winners. In the round of 5, the app finds user(s) who have correctly guessed 5 numbers, and sends out rewards. In the round of 4, the app does the same for users who have guessed 4 numbers, the slice of participating tickets is now short of winner(s) of round of 5. Rinse and repeat for the round of 3. For each of the three rounds the lottery generates sequences of 5 numbers and compares them to the strings of numbers in tickets until one or more winners are found. It can be said that the lottery “forces” the winning sequence onto ticket(s). With a limited number of users this seems to be the only sensible way of running a lottery and not having to collect and keep a large jackpot for months and years. Let’s take a look at the function that generates sequences of 5 numbers and returns an array of them to caller function. On average, this function is called hundreds of thousands of times to find the sequence of 5 matching one of the tickets, when we have a very limited number of participants. It takes fractions of a second. In PHP it takes a tiny bit longer (a second or two), although PHP 7 performance is really good. An important characteristic of a blockchain lottery app is: it must be completely trust-free. Everybody must be able to validate that results of the lottery haven’t been gamed. A logical and simple solution to this is to generate sequences of numbers with a deterministic seed. The problem with deterministic seeds: if they are known in advance, sequences of numbers can be predicted and the lottery can be gamed. To address this problem we turn to the Nxt blockchain again, to find a source of seed with a getSeed() function. The app runs at 18:00 UTC on Sunday. 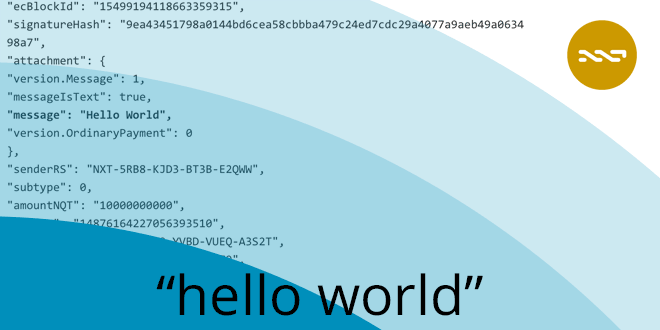 The first thing it does in the getSeed() function is to fetch the block id of the block which was generated 10 blocks before the app started (as seen in a local copy of the blockchain on the lottery node) and take the 5 last digits of the block id as a seed. Due to network latency and occasional blockchain reorganizations of 1-3 blocks, the lottery node may not see the same block as other nodes. The number 10 for getting the block for seed was chosen to be reasonably sure that block would not be reorganized. It can be argued that there is a theoretical possibility that the block id is predictable. The odds of this are tiny in my opinion but I’ll leave it to the readers to debate and decide. Now that the app has its seed, it can do its job in a way so users don’t need to trust the lottery host. The Go source code doesn’t include the routine to verify past results. The PHP source code does have it, it is fully functional and can be used to independently verify all past results with the deterministic seeds from the blockchain. For Go I use this function to send queries to the Nxt Server and return results. The results are returned as a JSON string and need to be unmarshaled into proper structs. Now that ‘validPlayers’ has all the good tickets we can start the game. process() receives an integer (5, 4, or 3) and other parameters, including validPlayers and runs three rounds of the lottery. It makes a call to getWinners() function, that one calls genFive() to generate sequences of numbers until at least one winner is found. 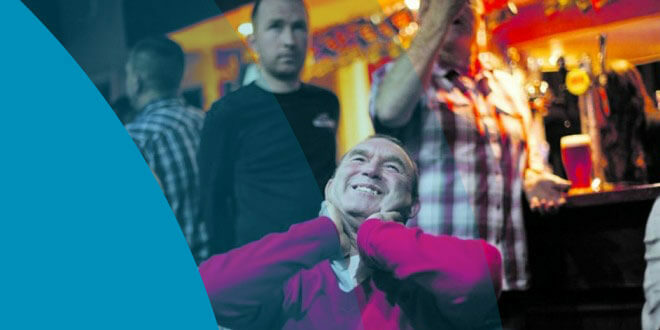 getWinners() returns results to process() which sends out reward, removes the winner ticket from eligible tickets and returns remaining tickets into main() for subsequent rounds. There is a helper function preparePlayers() which recreates validPlayers without the empty spots freed by the removed tickets. My next app will probably be a poll app, with immutable records of votes saved into the blockchain. Do you think an app like that can find usage in the modern world? By the way, Nxt has its own built-in Voting. It’s too easy to forget what Nxt has, because it has so many features and all those features are accessible through API, kindly programmed by the core developers for userland. You can ‘mine’ your first NXT coins to send transactions in the Lucky node project running a public node, come to nxtforum.org and you will find out how. Please leave your comments and suggestions. Blockchains can be useful in various applications, facing global audience and supporting company internal infrastructure. A blockchain is a distributed database, a copy of the blockchain is stored on each node in a peer-to-peer network. This extreme redundancy can be duely considered inefficient, but please stay with me for a couple of minutes of blockchain theory. As each node validates all transactions recorded into the blockchain and as past transactions cannot be rolled back or tampered with like in traditional RDBMS, this redundancy makes the blockchain *immutable*, and that is a very important value proposition of blockchains. Immutability of data is something traditional databases cannot provide. You may or may not need immutability of data and trust-free confirmation that data hasn’t been altered. In this tutorial I assume you do need this. One of the most versatile and flexible blockchains is the Nxt Blockchain (https://nxt.org). It has over a hundred API calls https://nxtwiki.org/wiki/The_Nxt_API. Today you will learn basics of programming the Nxt blockchain. I will use only two API calls in this tutorial. With over a hundred API calls opportunities for programmers are limitless. A customer of a company or an employee in an organization uploads a file through a web form. The file is renamed to a unique name and is saved in some location on the server. A year later the customer / employee needs to verify, using the Nxt Blockchain, that the file hadn’t been altered. For instance, this may be required for legal purposes. It doesn’t have to be files. Internal company memos can be hashed and stored in the database, to be verified in a future audit. Nxt allows us to send and record arbitrary messages (AM) into its blockchain. Every transaction on the blockchain comes at a fee. If the transaction size is large, it can be expensive; fortunately Nxt has a subtype of AM called prunable messages. These are pruned after 90 days which make them cheap, they are available for retrieval from archival nodes after 90 days. The maximum size of an arbitrary message in the Nxt blockchain is approx. 42 KB, the size of one block. A prunable message of 1 KB costs 1 NXT ($0.03). 1 KB is enough to store a hash of a file and this is our final cost to permanently record one hash in the immutable distributed Nxt blockchain. As the customer uploads a file I create a SHA256 hash of the file and store the hash in the database in the organization’s server. For simplicity I’ve chosen SQlite, but you can use Mysql, Postgresql, Oracle. I will use PDO to access SQlite database in PHP. When we do not use the immutable database (blockchain), the file can be modified, the new hash of the modified file saved in the database, making it hard to prove the file was like this from the beginning. Every prunable message can be retrieved from archival nodes. Every record in the blockchain is immutable. You can be sure the hash of the file you uploaded a year ago, when it is retrieved from the blockchain, is the same hash. All you need now is compare it with the hash in the organization’s internal RDBMS. PHP with curl, json and some db extension (I use sqlite3). A web server is optional, you can use php-cli. Java 8 (Oracle or OpenJDK to run Nxt). Nxt reference software: https://nxtforum.org/nrs-releases/nrs-v1-10-1/. Install the NRS (Nxt Reference Software (depending on the context interchangeably called Nxt Client or Nxt Server)) and create an account. Fund it with a few coins. You can exchange Bitcoin to NXT at an exchange service like https://shapeshift.io or exchange with someone at https://nxtforum.org. It is also possible to “mine” some free NXT as reward for running a node; http://test.nxter.org/the-forging-bounty-lottery-campaign-will-pay-5-million-in-rewards-to-forgers-and-nxt-nodes/. First we create a simple database table for our application, nothing fancy, you can add more column types if you must store more information. I like to use DB Browser for SQLite of http://sqlitebrowser.org. Using DB Browser for SQLite create the following table. ‘txid’ is the field for storing the id of a transaction we receive from Nxt when the transaction is accepted. It is unique. ‘hash’ is the sha256 hash of the file. In this tutorial I skip the file upload part of code to keep it concise. Let’s assume the file is already uploaded and stored on the web server. We define the file location variable in the code. The other important variables are the passphrase of the Nxt account you’ve created and funded and the recipient’s account. You can send the message to yourself, recipient can be your own account. The next part of code is the function that submits query using curl in a POST request. To make a query we must define $payload and $payload_string variables and feed them to sendRequest(). It is possible to run the Nxt Server over HTTPS and use curl to verify the SSL certificate, but for this simple app we have disabled SSL verification in the curl connection. Another point of interest is the $errorDescription, json-decoded from server response. you must add error handling routine. I omit this too. For this app I assume the server responded properly, and return the response into the app for further processing. As the file is uploaded already, I create a sha256 hash of the file and timestamp. I will use PDO to work with the database. Open the db and insert a new record. We don’t know the txid until we talk to the Nxt Server that can give it to us when transaction is accepted on the NXT network, so for now I’ll insert null for txid. Next we create a query to send to the NXT server. This particular query is “sendMessage”, you can find a whole lot more queries to interact with the blockchain and their mandatory and optional parameters at https://nxtwiki.org/wiki/The_Nxt_API. As I said earlier the fee to transact is 1 NXT. 1 NXT = 100,000,000 NQT (nanoquants). 1 NQT is the smallest unit of denomination in NXT same as 1 satoshi in Bitcoin. 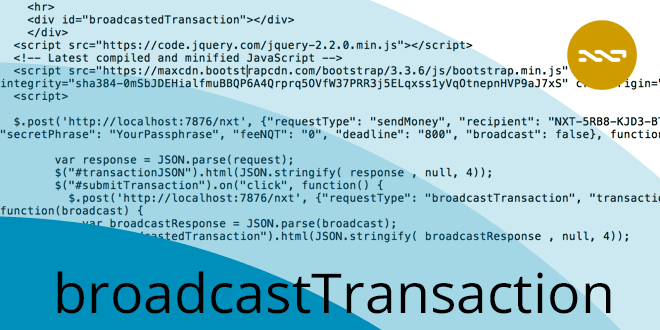 The “broadcast” parameter can be changed to false, in this case you will receive ‘transactionBytes’ in the response, which can be broadcast to the network later using the ‘broadcastTransaction’ request. But today I have set it to ‘true’ to broadcast the transaction instantly. Remember to urlencode() the message. I insert the filename separated from the hash with a colon into the message. Now that there is a positive response on the accepted transaction and its ID is known, let’s update the record in the in-house db. Optionally email the customer the $txId that they can later use to verify hash or somehow else give them basic information on retrieval of the hash from in-house db and comparing it to blockchain stored hash in the future, by timestamp or other criteria. This app doesn’t include user authentication. Normally the customer or user of an intranet service would be able to see their files after having authenticated to the site. This app also assumes that the verification app is out of reach of the in-house database maintainer to prevent faking verification outcome. Now the record is saved in the company’s database. Show the db record to confirm it’s there. passed to them when the transaction was submitted to the Nxt Blockchain. Suppose the customer does have it, saved in the mail archive or retrieved by other means. Let us see what our in-house database has for the hash of the file. Fetch and save it in $hashInDb. Send a request to the NXT server and fetch all information stored in the NXT blockchain for transaction with the given ID. Decode the JSON response and extract the attachment field where the hash is stored. In the first part of the app we recorded the filename separated from the hash with a colon. Now we extract just the hash portion of the arbitrary message. And compare what we have in the company’s database with what was recorded 1 year ago into the Nxt Blockchain.